Lusatia, a major industrial region of Eastern Germany, is undergoing transformation to become a future European energy region. This change has been initiated by the Federal Government, which is why Lusatia is the absolute focus for industrial resettlements, especially with regard to energy issues. This promotional focus of the Federal Government meets with the special role of Lusatia, as a transnational region of the federal states of Saxony and Brandenburg. Both federal states are also willing to combine their support mechanisms for industrial resettlements to the advantage of an investor. Lusatia, with its location in the border triangle of Germany, the Czech Republic and Poland, also opens up special support mechanisms for industrial settlements with an unrivalled nationwide appeal, perhaps there will be nowhere in Europe with better conditions that an investor with maximum funding can exploit! The people of Lusatia are proud of their more than 100 years of history as an industrial and energy region. The enormous growth of the region in the past century led people from different regions of Germany to Lusatia. They transformed the large energy district of the former GDR into a modern industrial region. Nowhere in Germany can one observe the harmony of industry and quality of life as in Lusatia today. People relax at lakes or amusement parks overlooking large industrial plants. They consciously live with their region, they are hard-working and believe in success. They have always made the change in recent decades, including industrial upheavals and reorientations. They are very open to new things in the industrial sense. This mentality makes Lusatia especially strong. In the middle of Lusatia, DEKRA is building Europe's largest independent center for automated and networked driving. Mercedes-Benz has just invested 100 million in its second battery factory in Lusatia and has made Lusatia the basis for the development of its e-mobility. Many suppliers in the Lusatian economic area work for the automotive industry - Borbet built a new plant and Chinese investors announced the construction of a new factory in Lusatia. With its convenient location to the centers of the automobile and engine centers of Eastern German, Lausitia offers best synergies: three VW locations and BMW in neighboring Saxony and Rolls Royce in the nearby the Berlin outskirts. The BMW Leipzig plant is the group's electromobility center of excellence and the majority of Porsche vehicles are also produced in neighboring Saxony. 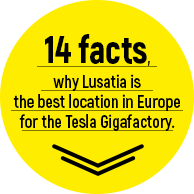 The Tesla Gigafactory Europe in Lusatia will find the best conditions for the construction of the car of the future! Lusatia is the green campus between Berlin, Dresden and Leipzig. Six technical universities are located in this catchment area. The region has enormous know-how in the automotive sector; examples are Rolls Royce in Dahlewitz, VW in three Saxon locations, BMW and Porsche in the Leipzig area. Lusatia, in particular, will have enormous potential for qualified employees and specialists in the coming years for an industry of the future. Currently around 25,000 specialists work in the open-cast mines and power plants of the energy company LEAG and its many service providers, such as plant builders, engineers etc. Due to the politically induced change of this energy industry away from the fossil energy source towards future topics, enormous potentials will be released here in the coming years, from skilled workers to highly qualified engineers, from craftsmen to managers. This potential is available to an industry of the future. At the technical universities and affiliated institutes in Saxony as well as Berlin-Brandenburg diverse topics of electromobility are taught. Germany's only university-owned EMC research laboratory is located here, where research on topics such as automation, lightweight construction and energy issues of the future is conducted. In Lusatia, the BTU Cottbus-Senftenberg and Görlitz-Zittau University of Applied Sciences have installed four university locations. The universities maintain close interdisciplinary cooperation with the nearby university locations in Wildau, Berlin, Dresden and Wroclaw. In particular, storage issues will play a central role in the Schwarze Pumpe Industry Park and in the future, in the Lusatian universities. The focus of Lusatia as a cross-border region of the federal states of Saxony and Brandenburg is still on energy, with the world's most modern lignite power plant park, which has reliable and affordable energy. In the course of this industry, a variety of industrial service providers have emerged, which are mainly active in plant construction. Energy-intensive industries have grown in Lusatia in the course of safe and affordable energy - BASF Schwarzheide supplies plastics and a wide range of products for the automotive industry, from steelworks to ironworks. Lusatia is considered a pioneer in industrial automation. This area is growing dynamically in cooperations of large companies such as Siemens with the technical colleges of the region and offers enormous future potential for industrial resettlements. Lusatia has been a centre of energy for over 100 years. People live with the energy region and with their change. Today, Lusatia is one of the pioneer regions of an ecological energy transition, nowhere else is the transition of fossil energy to renewable energy so pronounced. Lusatia is one of the largest coal mining areas in Europe, but also home to the exemplary wind power industry and e-mobility centres. Politics and business are setting the right conditions for industrialising Lusatia as a modern energy region in the future as well. The region is predestined for this change towards a future field such as e-mobility - both mentally and in the orientation of politics, the economy and society. The Lusatia is the ideal location in the middle of Europe. It already extends as a geographical region in the eastern European neighbouring countries of Poland and the Czech Republic. Its location on the German border also makes it an ideal link from a historical perspective: its solution to its former affiliation with the Eastern European Confederation in the wake of the reunification of Germany signalled the building of a free Europe. Historically, Lusatia, in addition to the immediate border, unites a mental proximity to Eastern Europe. 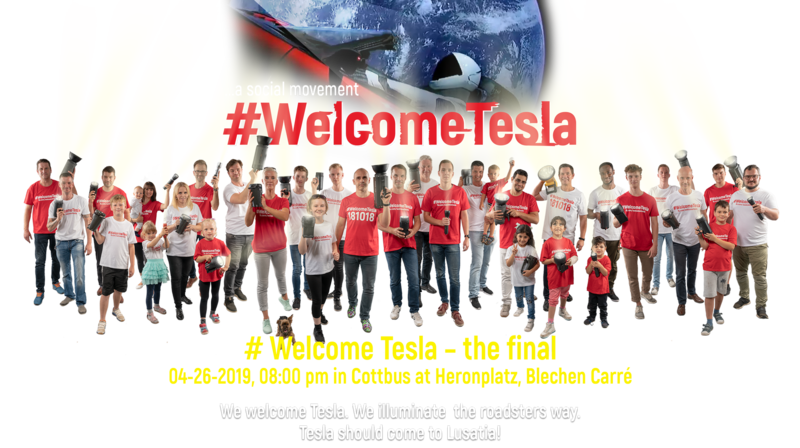 It is therefore the best place for a Tesla Gigafactory Europe, which can set a signal for both Eastern and Western Europe and thus integrate and connect Europe. Its location, as a link to Eastern and Western Europe, makes Lusatia a logistics hub. (The location of Lusatia, linking Eastern and Western Europe, makes it a logistics hub). Important transfer axes such as Paris-Berlin-Warsaw-Moscow run through the Lausitz, on the rail there is a direct connection from Lusatia to China. Innovative logisticians now provide terminals in both parts of Lusatia, Brandenburg and in the Saxon, with direct connection to overseas traffic. Logistics terminals for container handling are already installed in Schwarzheide (BASF) and in the Schwarze Pumpe Industry Park. Immediately adjacent to the Lusatia, Germany's state-of-the-art and largest airport in the capital region is being built, and Leipzig Airport with its 24-hour service is also next-door. The Lusatia offers a location advantage for the construction of a new industry, above all with safe and favorable electricity supply. For a Tesla Gigafactory Europe, however, another raw material factor comes into play. Just over two hours drive away is located in the rear of the border of the neighboring Czech Republic Central Europe's central lithium deposits estimated at 330 kilotons. Lusatia is predestined for economic cooperation with the Czech Republic - the energy company LEAG is by far the strongest economic factor in Lusatia and belongs to the EPH Group with headquarters in the Czech Republic. The Lusatia has thus also the best relations and the necessary proximity to the important commodity partner. The EU and Germany are planning the gradual phase-out of lignite-based energy production. This implies the prospective government-enacted loss of jobs that is to be counteracted by structural measures. Measures that Lusatia will significantly profit from include special funding for businesses to locate in the region, infrastructure development as well as the establishment of special economic zones. Lusatia is already attracting extensive investment owing to its excellent logistical location within Europe, its high potential of qualified jobs, its excellent infrastructure for the settlement of big companies, intensive networking with research, science and educational institutions as well as its extremely attractive living environment (Lusatian Lakeland, Berlin, Dresden). Bosch is investing EUR 1 billion in a chip plant for the development and production of chips for increasing digitization in the automotive industry and other fields of application. Daimler too is investing EUR 1 billion in a battery plant in Kamenz. DEKRA has acquired the EuroSpeedway Lausitz race track to become Europe’s testing and development center for automated and connected driving. BASF will likewise soon be investing in Lusatia, implementing investments in the field of battery component production at the Schwarzheide industrial site. At the Schwarze Pumpe industrial site, LEAG is constructing Europe’s largest energy storage system with 52 megawatt capacity. Europe’s most important lithium deposit of 330,000 t is only two hours’ drive away. The biggest employer in the region, Czech-owned LEAG, offers the prospect of good relations to the Czech Republic as a partner for raw materials. Lusatia is situated in the middle between the metropolitan areas Berlin (population 3,500,000), Wrocław (pop. 630,000), Poznań (pop. 540,000), Dresden (pop. 560,000), Prague (pop. 1,300,000) and Leipzig (pop. 580,000). The triangle of where the borders of Germany, Poland and the Czech Republic meet offers not only access to six technical universities with over 60,000 students, but also a huge potential of skilled employees with an industrial background.